Here’s a quick review of what we saw and did on Thursday at Gigbeth – just the shows really, as we haven’t chance to make the conference aspect (David Nikel has a post about that). I’ll try to leave out any conclusions about the event as a whole too, at least until we’ve been to all three days. On a personal note it was both nice to bump into Pete, and Christopher for the first times (as well Nick too) – if that speaker had come down there might be no blogging on Brum today. The bands had spent “a weird day with people we didn’t know” hanging out together jamming yesterday – I’ve never really heard of that at a festival before – it was a shame that the sound guys hadn’t had a similar bonding session, because technical difficulties didn’t really cover what was going on. Nizlopi played without amplification for at least part of their set – while Achanak set up behind them, the tabla player making frantic signals to the gazebo’d sound desk. At Live Aid, Harvey Goldsmith came up with the idea of a rotating stage to make quick turn arounds possible – at Gigbeth they’ve come up with the idea of one band setting up while the last are on stage. At Glastonbury, reporters always talk of “the Blitz spirit”, but you don’t often see that on stage – in fact despite Achanak and Nizlopi being plagued by drop outs the atmosphere was that of a relaxed pick-up gig, brought about by the jam session yesterday (and the infectious Mr Hudson, more of whom later). 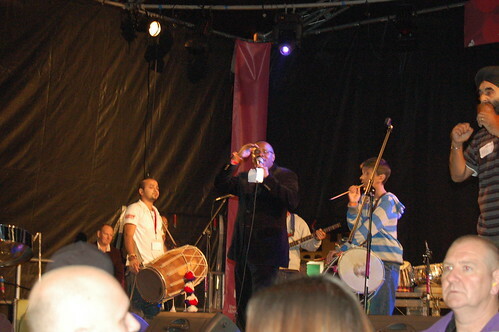 Nizlopi didn’t play the song about the digger, they swore, gave shout-outs, were backed by a French Horn, swapped instruments mid-song, and brought the dhol players into their last song so the sets, though short, merged into one. Achanak were jumpy, loud and modern and showing a disregard for ‘cool’ that your average band don’t have – not since Lieutenant Pigeon has a band spanned the generations and still rocked so thoroughly. Dennis Seaton from Musical Youth was compering the night and he gave the big build up to homecoming jazz guru Soweto Kinch, he refrained to mention his Brummie of The Year Nomination tho’. In fact there was the never to be repeated event of three (at least!) Brummie of the Year nominees in the same place – Soweto, Pete Ashton and we saw Martin Mullaney too. Big Chief Busks-with-recorder was obviously out canvassing. Soweto did a piece from his B19 album, some freestyling and some call and response stuff with the crowd which was well received even though the whole crowd thing is a bit “Soweto can’t hear you, Hi-De-Hi” for me. The beatboxing double-bassist from Nizlopi joined in, as did local MC whose name now escapes (any help? ), and by the end Ben ‘Mr’ Hudson was at the back whacking the snare drum a full collaboration was developing. Soweto himself said that Ben Hudson had been responsible for gelling the bands together and, by the time his band (Mr Hudson and the Library) officially too the stage, he was pulling everyone in, not letting them leave the stage, calling out “get him something to hit” and forming what he termed the “Handsworth Percussion Collective”. Ben Hudson is an odd guy, you don’t get many feted-pop-stars-in-waiting wearing car coats and a flat cap (and braces! ), he seems London on the surface as he’s almost too confident for his own good, but when he lets slip that he’s from Handsworth Wood and alters his lyrics to mention the 16 bus, he jumps in my estimation even more. He tells us that he went to a posh school (leaving me wondering again) what we work out is King Edwards Edgbaston, and his chums were to scared to visit him in the “ghetto”, he sings about the fact that the 61, 62 and 63 busses “all go to the same place anyway”. Their songs are fantastic but we don’t get to hear too many, it’s not that sort of night. Dennis is good naturedly press ganged in to sing “Pass the Dutchie”, Ben Hudson whispering the chord changes into his American bass player’s ear, crowd left to do backing vocals “how does it feel..” – you can tell I’m filling up. By this time you realise that there are about six bands on stage, including a Bill Oddie lookalike on double-bass and part of the Orchestra of the Swan. They segue into “A Message To You Rudy” – sending a certain section of the crowd into spasms of delight – Dennis doesn’t know all the words, which is okay as only the French horn player knows the tune. A triumph of a spirit that is open and fresh and makes you feel good inside, and is in a way peculiarly Brummie. I did cry a little. Afterwards we popped into the Sanctuary for the end of the Radio WM Introducing gig, were impressed by The Hoi Polloi and have a theory that Birmingham has more pipe organs per square foot than Venice. We also went the the Rainbow afterwards, which was great too, but maybe catnip will tell us some more about those (as she took a free CD or two and will no doubt be researching). Igbeth Hursday about sums it up.